GN Solids Control has been provided many dredge dewatering systems for global customers. 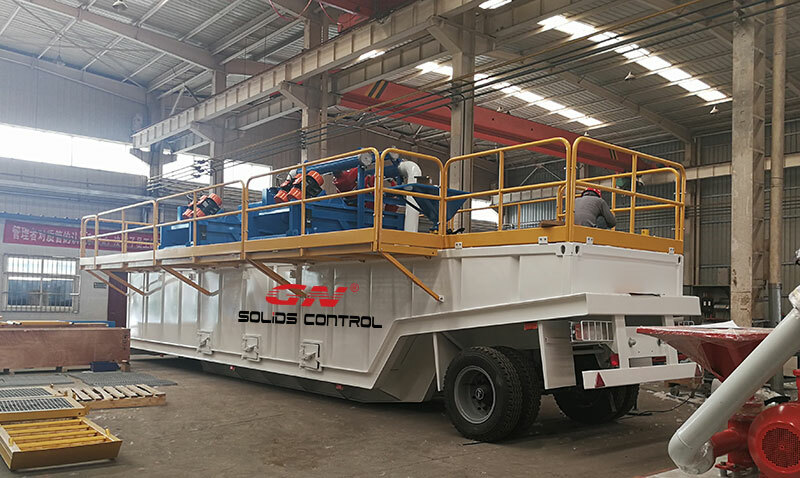 Based on the move methods, GN dredge dewatering system is classified into the following 2 types: skid mounted treating system and trailer mounted treating system. 1. Total power requirement at most likely and max load for determining power generator requirements. GN Solids provides ‘GN Equipment Power List’. All the listed components are controlled by GN control boxes. You might need to prepare a distribution center and connect them to GN control boxes. 2. System dead load and axel load (ESAL). ’35ton 2axle LOW BED’, whole dead load can hold up to 35T, axel load is 21T. 3. Is it possible to get the transporting height of each trailer below 14 ft so we wouldn’t require to permit the transport of this system in Texas? We can decrease the height below 14ft. As there is no separated compartment, so there’s no pump cavitation. #1 tank and #2 tank they are connected by overflow, as long as the #2 tank liquid discharged port higher than centrifugal pump inlet port, there will be no cavitation as long as #2 tank has fluid inside. 4. Does GN have any clients that use conveyor systems to move the dredge material away from the trailers, or do they just use bucket loaders to move it on the fly? It depends, some of GN customers using screw conveyors while some of them use bucket loaders. Screw conveyor can be used to transport to a truck directly, while the bucket loaders can be replaced with another one and also move easily. 5. Max pump pressure and pressure system weak points. Max pressure 0.5Mpa, there’s no pressure weak points as the whole system pressure is less than 1.0Mpa, actually they are not pressure pipe system. 6. Details on pressure safety system such as pop-off valves and other PSVs. This system has on and off valves, centrifugal pump inlet and mud cleaner inlet both controlled by valves. There’re no pressure control components inside as this is not a pressure system. GN Solids Control has provided many dredging systems for our clients. Almost all the GN dredging mud systems are customized in order to meet customers’ needs perfectly well. GN also manufactures standard mud systems for dredging. For dredging, typical slurries have the following composition ranges. There are different layers in the sediment. For natural lakes, coarse debris is found near the river inlet and fine material builds up near the outlet. UAT customers also use the dredges for many man-made water bodies that can have unusual layers of materials. It is better to size the dewatering equipment for the majority of production, instead of the most difficult requirements. Design the dewatering equipment to handle only the 20% MAX solids slurry at the specified flow rates; the dredger using UAT’s small equipment can decrease the flow rate for the occasions where they are processing high-solids slurries. 1. GN Solids Control manufactures a scalper in the system before sending the sands/clays/silts to the shale shaker. Coarse debris includes rocks up to 10cm, trash, leaves, twigs, and sea shells. Screens on GN scalper are made from metal or polyurethane. 2. For the 4 stages separation, after separated by the scalper, GN Solids Control provides one shaker for second phase separation. The shaker will be a double deck shaker with different API Nos. shaker screens. 3. GN cyclones are used based on the mud they are separating. Bottom shaker will be the same as the shaker using in the front. 4. Generally speaking, GN equips one polymer adding unit before sending to GN decanter centrifuge. By adding polymer, fine solids will gather together and it will help the centrifuge to separate them out. GN Solids Control also manufactures standard dosing unit which the same size a 20 ft container.